Umbrellas of Cherbourg is due to close early after some disastrous reviews. However, despite a half empty theatre, this Kneehigh production manages to create a unique atmosphere and effect. It’s not your usual musical, but has a charm all of its own. First thing’s first. I can see why some people have found this production irritating. Whilst I have no time for those who complain that there are ‘no big numbers’ – if every musical followed a set formula, the novelty of seeing them would quickly fade – the fact that the show was entirely sung through did grate slightly. Unlike the quickly quelled initial awkwardness of not knowing where to look on first sight of the puppets in Avenue Q, Umbrellas didn’t succeed in dragging me away from the consciousness that entirely sung dialogue was, well, rather odd. There are many very positive aspects of this production that mean that it is still well worth seeing. The staging is absolutely fantastic, shifting into a myriad of forms without ever losing a flowing momentum, understated but quirky, revolving like a scaffold carousel between scenes. The use of three sailors as dancers, ‘extras’ and movers of the actors in a flight-like motion add to a dreamlike quality that seeps throughout the whole show. This, along with the faultlessly stylised (and self-consciously French) set design, helps to create a visual masterpiece that is hugely memorable. The young lovers atop a slide integrated into the set next to a neon ‘Je t’aime’, the dancing mechanics in breton tops and berets, and the multicoloured facade of the Parapluies de Cherbourg being particular highlights. In a style reminiscent of Jean-Pierre Jeunet’s Amelie, the production was of an extremely high visual quality. Arty and retro, it managed to be tongue-in-cheek with its stylishness, an element of the comedy woven into the set and clever use of props. The story is a tale as old as time, and though I haven’t seen the film, I was left with the suspicion that Catherine Deneuve may have been part of a more involving version of the narrative. The plot here conveys romance and a ‘c’est la vie’ maturity, but I was not convinced by the supposedly heart-breaking journey taken by Carly Bawden’s Genvieve, and Andrew Durand’s Guy came across more as a little pathetic than a convincing romantic lead. However, great support was available in the shape of Joanna Riding as Genvieve’s Umbrella shop owning mother and Gillian Budd (understudying for Meow Meow) as the Maitresse, a cheeky guide through an evening which climaxed in a washing-up-liquid snowfall encompassing the stage and the front stalls. The amount of criticism this show has received has undoubtedly been unfair – it has some stark winning qualities that won me over, but it is equally clear why it has displeased some. I had a lovely evening, revelling in the show’s beauty and charm, but it may be best to go prepared to take the plotting and uninterrupted singing as dents in what would otherwise be a smoothly coherent vehicle for Kneehigh’s originality. 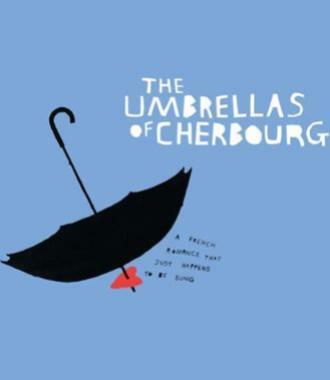 Umbrellas of Cherbourg is showing at the Gielgud Theatre until May 21st. Tickets with a face value of £58 are currently available on the day for £28 at TKTS (see highly recommended links).